S T A R T H E R E 2 0 1 8 W e live in an era where the options to grow as a professional are multifaceted. From conferences to networking events and trade shows, the possibilities are endless. It can be over- whelming at times. However, trade shows are beneficial and necessary in your busi- ness journey. Perhaps you are a veteran in your industry and are looking to expand markets, or new to the business world and are just getting your feet wet. 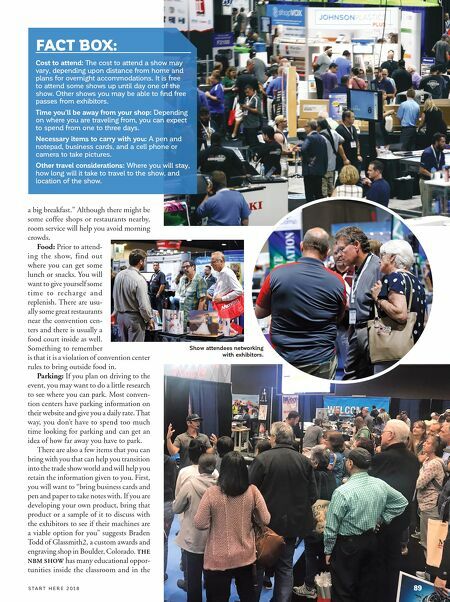 Regardless of where you are in business, industry events like THE NBM SHOW has something for you. From time-saving tips to trade show insights, we were able to catch up with a few industry veterans to help you prepare for your next trade show. Trade Show Preparation Preparation is key and can make or break your trade show experience. Most trade shows are in the hosting cities' con- vention center. With that said, here are a few items that you may not think of come the day of the show that will prepare you to make the most of the experience: Review the show's frequently asked questions page. Chances are, the questions that you have about the show are already answered. You will likely do a lot of walking. Wear comfortable shoes or bring extras to swap out mid-day. Don't skip out on a good breakfast. If you plan on walking the exhibit hall or attending some classes, you may not get a lot of time to eat. Rachel Stuckey with Awesome Graphics (a print/sign shop in Hobbs, New Mexico) suggests that you "start your morning with room service and Becca Corona has been with National Business Media, Inc. since 2014, and cur- rently serves as the Marketing Specialist for the Audience team. In her role, she contributes by helping to ensure that readers and attendees continue to stay informed and have a positive experi- ence while attending THE NBM SHOW and that they understand how to refer- ence NBM's industry resources. 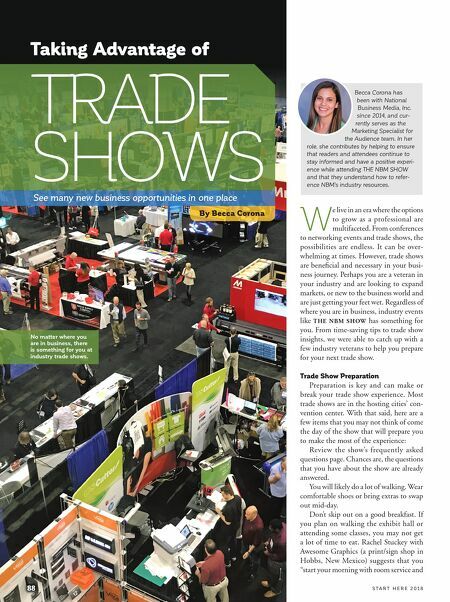 Taking Advantage of 88 TRADE SHOWS By Becca Corona See many new business opportunities in one place No matter where you are in business, there is something for you at industry trade shows.